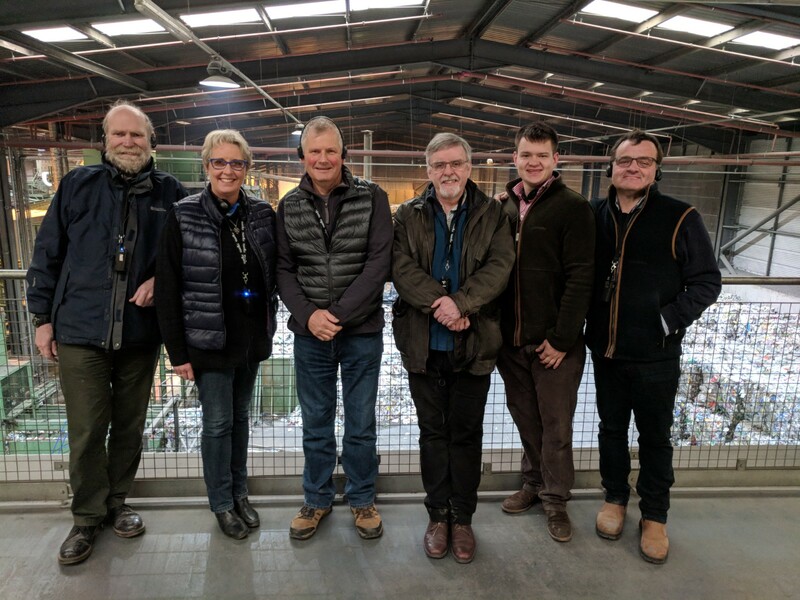 A couple of weeks ago some of our Parish Councillors visited the EnviroSort Recycling Plant at Norton, just outside Worcester, and it was a real eye-opener. Not only did we learn lots of things we didn’t know, but in my case it was particularly useful in helping me unlearn things I thought I did know! This was particularly well-illustrated when the whole plant came to a halt, and an old mattress was removed from the system by two operatives and placed in disgrace in the naughty corner. “Fancy thinking we could re-cycle a mattress!” said our guide, and everyone nodded sagely except me. Until a few minutes ago, I would have thought exactly that. Strip off the fabric – surely that can be recycled? 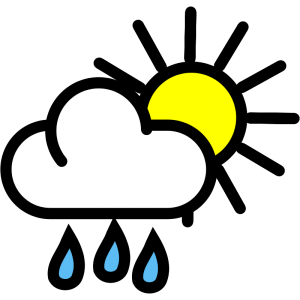 – and melt down the springs into ingots of reusable metal. Yes? Well, no. Recycling, it turns out, is not an abstract concept. The contents of all our green bins and recyling bags are collected by Herefordshire Waste Disposal Services and taken directly to the Norton plant, where it is guided along a series of conveyor belts at up to 30 tonnes per hour, six days a week. Different plants around the country contain different selections of sorting machines, which is why there are so many different, sometimes confusing, lists of what can and can’t be recycled. It’s not the result of academic discussion; it’s what each particular plant can handle. Our own rubbish is dumped unceremoniously onto the concrete floor of the huge, barn-like shed which encloses the plant, and then lifted into a hopper by a man in a tele-handler. And off we go along the road to separation and sorting. Big mattresses don’t fit into through the hole into the first sorter. The whole process is clean and dry. Rubbish which is decomposing (dead lambs), unhygenic (used nappies), or wet (half-filled coke tins) contaminate everything around them and present serious health hazards, so the first thing that happens is that a row of human operators pick out all the unsalubrious things and reject them. Any stuffed bag has to be cut open and emptied for inspection, wasting time, and the bags themselves can clog the machinery and bring the whole system to a halt. The next stage consists of a series of non-interlocking rotating steel cogs which crunch glass into tiny fragments and drop it into a skip below. Everything else bounces along on top. The colour doesn’t matter, and the labels get torn off (or removed at the glassworks), so don’t need to be removed by the public. Unfortunately this, and the next piece of machinery, also lets small things through, such as metal bottle tops or shredded paper, and textiles and flimsy bags can wrap themselves around the moving parts. Next the rubbish passes onto a slope of ridged metal planks, moving up and down irregularly, which catch flat things on the ridges, moving them upwards, while more three-dimensional things don’t catch, and roll downwards. This is intended to separate out paper and card from bottles, cartons and cans. If the latter have been flattened, they may catch in the ridges and go up with the paper and card. The three-dimensional objects now pass under a magnetic sweep, which removes all the steel cans, and a series of optical plastic detectors, which identify different types of plastic from how they reflect light. They can even work with different colours, but they don’t detect black. Objects of different materials are blasted off the conveyor belt into storage bins by air-jets. As the rubbish topples off the end of one conveyor-belt, an induced eddy current across the belt ejects non-ferrous cans into another storage bin. Composite materials, such as cartons or crisp packets with foil linings, cannot be detected and have to be removed by hand. However, most mixed plastics, such as the caps on bottles or the spouts on drink cartons, can now be left on. Eventually everything gets squashed into huge cubes of pure material; paper, card, and different metals and plastics, which are taken off around the country and across the channel either for immediate re-use or further sorting. The rejected material goes to the Energy From Waste site at Hartlebury, to be burned to generate electricity. Less and less of our rubbish is tipped into landfill sites. At every stage there are human operators picking out irregularities, helping the mechanical sorters do their best job possible. The better we understand the process, and the more careful we are with what we put into our own, Herefordshire, bins, the more efficient the process, the less that ends up in landfill, and the better for mankind and our environment.